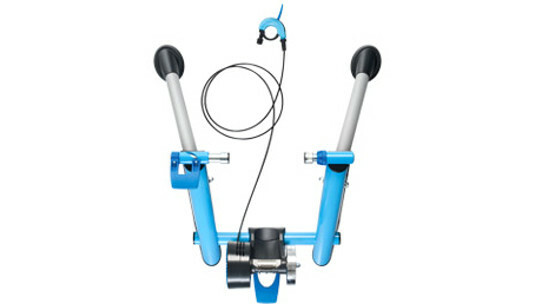 The Blue Matic is the intermediate model of the Blue cycle trainers. Its maximum resistance is 700 Watt. The Blue Matic has a magnetic brake with permanent magnets. You set the resistance selecting one of the ten different positions via the handlebar resistance lever. During your training session, the resistance increases as you cycle faster or switch to a heavier setting. The robust frame stands firmly on the ground and it is very user-friendly because the trainer can be assembled in no time at all. Do you have a basic trainer? Then all you need is a speed sensor to be able to train with your smartphone or tablet! Many training software programs, such as Tacx, Zwift and TrainerRoad, work with Virtual Power. To do so, your power is calculated using your speed and the resistance level of the linked trainer. You, yourself, indicate what position the basic trainer is in and the linked speed sensor transmits your speed. The software then calculates what your power is. Virtual Power is less accurate than measuring your power directly, but sufficiently accurate for these programs. Every trainer has its own power curve, certain speeds linked to certain power values. 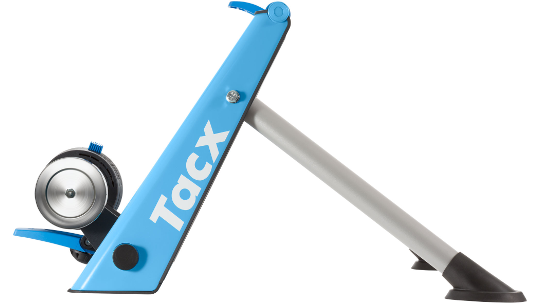 The various training software packages have the power curves of all Tacx trainers. If you use Virtual Power, you must make sure that every time that you start training, both the pressure between the rear wheel and the trainer and the pressure in your tyre are linked. If they are not linked with one another, inconsistencies will be introduced into your measurements.